Penn Waste provides trash hauling services to Borough residents. The monthly rate is $25.65. Trash charges are billed on your monthly utility bill. Weekly service consists of four 32 gallon trash bags or cans, one bulk item and unlimited curbside recycling. Please be aware that each bag/can must not exceed 32 gallons or 50 pounds. Overweight bags and cans are unsafe for our loaders to lift. Also, please have your items placed at the curb prior to 6:30 A.M.
For missed trash pickup and other service issues, please call Penn Waste Customer Service at 866-575-8720. 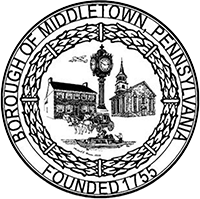 Middletown Borough offers electric and trash utility customers the convenience of paying 24/7 with online bill pay and a drop box in the parking lot at the rear of Borough Hall. Borough utility bills can also be paid in person during normal business hours with check or credit card.